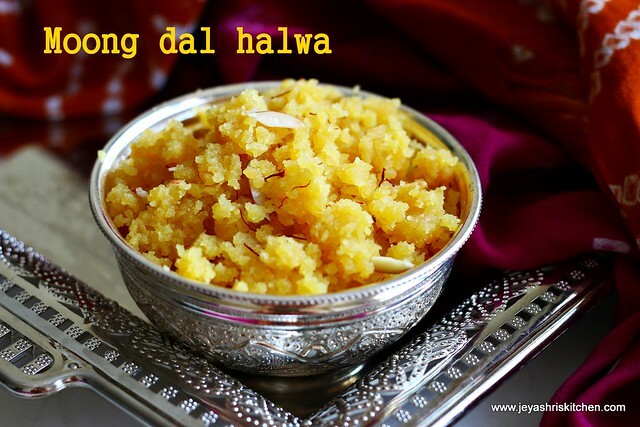 Moong dal Halwa is an awesome North Indian sweet . I have tasted this few times in my friends house but never attempted to make it on my own. 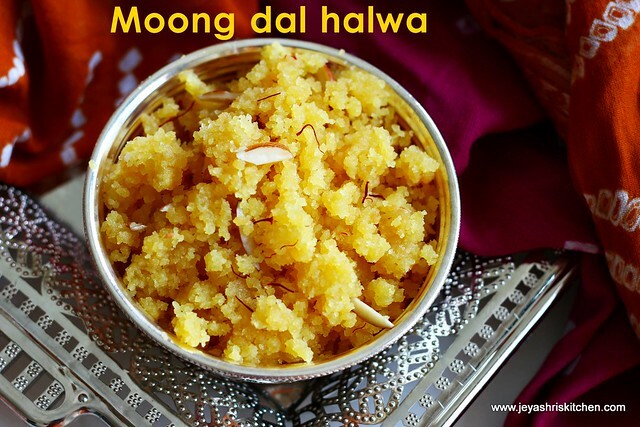 I wanted to post a nice and exotic sweet recipe for New year 2015 and tried this before coming to India for vacation. I clicked the pictures and posting now from India. I wish all my readers a very Happy New year 2015. Let this year bring lot of prosperity and abundance in all positive ways . Thank you for the continuous support and i will give my best to give more nice and detailed recipes in this year 2015 also. I adapted this recipe from Tarla Dalal cookbook. 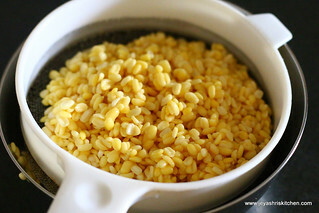 Soak the moong dal in water for 4-5 hours. 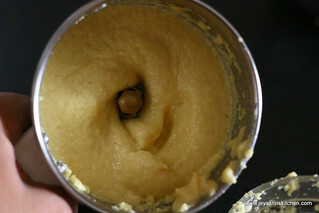 Grind this into a paste without adding any water. 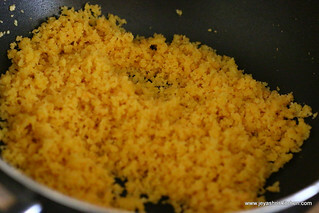 You can grind this little coarsely too. LAter only i came to know about that through my co sister. 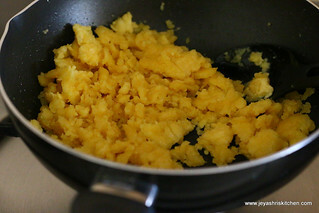 In a pan melt the ghee and when it is hot add the ground paste and saute this in a low flame. Saute this till it turns golden brown. 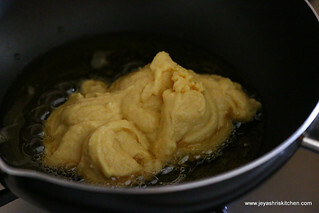 Initially it will become slightly a whole mass and gradually it will get separated . 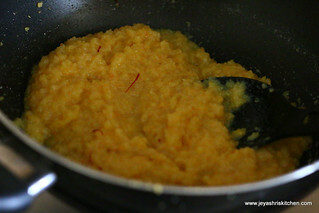 Meanwhile warm the milk and take 1 tblsp from this and soak the saffron in it. 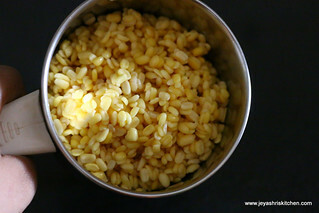 Add the rest of the milk to the sauted moong dal. Cook in a a low flame to get the milk absorbed. Add the saffron to this too. 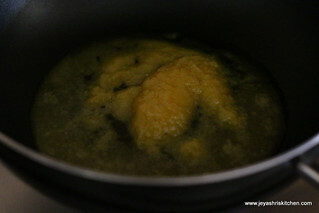 Add sugar to this and cook till the milk get absorbed. add cardamom powder if you want at this stage. 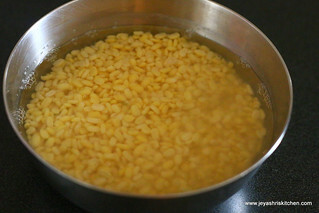 Slice the almonds thinly and garnish the almonds to the halwa. 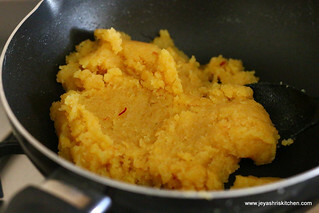 Many people add khoya to this to make this more richer. 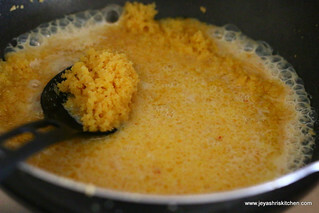 If adding khoya ,scramble the khoya and add it after adding milk. Condensed milk can be replaced with milk and sugar. 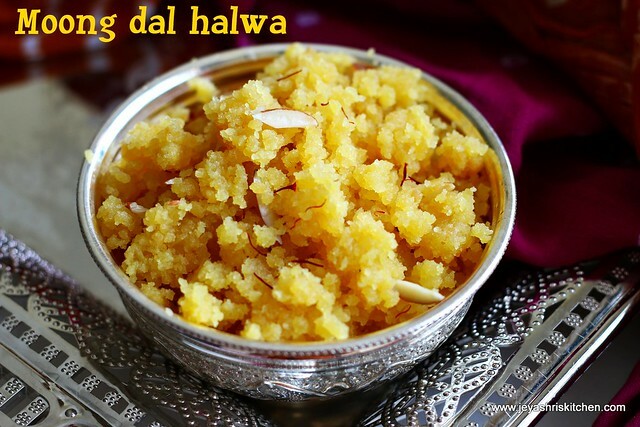 This gives an awesome rich flavor and taste to the halwa. 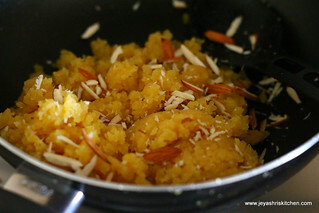 A non stick pan works out wonderful for this halwa. Yummy and authentic sweet!! Wish u a very happy new year!! Looks yum and have loved it like crazy.. Have seen this made in sweet marts in Maharashtra, the enormous amount of ghee which is quintessential and then keep stirring for 3-4 hours till the desired brown color is achieved! !